I’ve never really liked clutter. First of all, because I don’t know how to clean up after myself; therefore, I stay away from clutter and secondly, I like the bare necessities. I guess you can say that I am a minimalist, even in my art, I revel in the simplicity of things, I write about the mundane-ness of an idea, I see the good in less, and more often than not, I like function more. However, as an artist, I need form too. So when the minimalist movement in interior design decided to shift to warm and cozy, I could not be any happier. The minimalist movement started out as cold and stark when it began around after the World War II. When industry boomed and houses and buildings sprouted like mushrooms, people took notice of the dominant design which is leaning towards the more ornate, the minimalist movement happened in response to this. Scandinavia and Japan are two countries that are the biggest embraces of this movement; in fact, history says that these two places also played a big role in the movement itself. The minimalist movement was started by three painters who decided that, instead of creating another space the existing space should be part of the artwork itself. 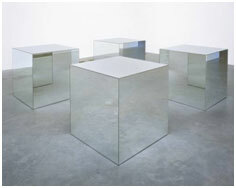 They are Donald Judd, Robert Morris and Dan Flavin. These artists started out as Abstract Expressionists until they decided to use materials that are not conventionally supposedly a part of art. Early minimalists started out that way, employing non-conventional materials to be part of their artwork. 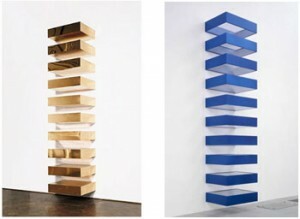 Donald Judd created these untitled art pieces during the 1960s; he recreated the same concept with different colors. The use of clean lines and the use of unconventional materials back then were new and cool compared to the hot abstract expressionist art which was then dominant. One thing that the minimalist movement was known for is its use of space. Here, the artist clearly shows us how space is employed in his art, he used the existing space by making it part of his show. Instead of creating another space or “reality”. You will see this philosophy all throughout the minimalist movement from visual arts to interior design, music, and fashion. This work by Dan Flavin also speaks for itself. 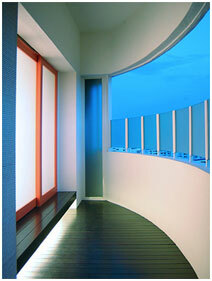 Fast forward to nowadays, we see the minimalist everywhere, from fashion and music to architecture and design. Still, echoing the same philosophy, space and the reality it presents. 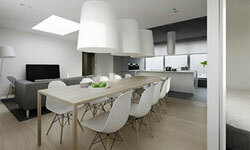 From stark and cold to warm and inviting, see how the minimalist movements have taken its influence in our homes. This space designed by Ikebuchi Designs, shows the use of clean lines and strokes all around the space and matches it with homogenous fixtures and furniture’s. The staircase leading the upper floors also shows an ingenious use of space, instead of creating the staircases steep and uncomfortable to walk on, the design idea employed in this home makes it easier to walk on and it looks swanky too. 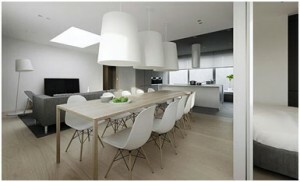 If you really want to pay homage to the minimalist movement, white is the way to go. Creating contrast between white and other colors created depth and texture. If white and black contrast in too stark for your liking, you can always mute it down with beige, crème, peach, or neutral browns. Adding a pop of color like bright yellow or electro pink makes it look more interesting, but still paying respects to the space it occupies. This space created by Amir Sultan of Khas Designs almost defines the spirituality of the space – something that the minimalist movement has not rid itself of, the assumption of the spirituality of space. The minimalist movement wasn’t focused on spirituality at first; however modern designers have their own work ethos and philosophy, so spirituality in this case must have come into play. The clean lines combined with natural and artificial light creates a space that is both interesting and soothing to the eye. 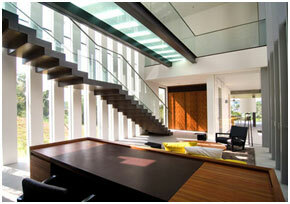 Good use of space is the first priority in creating a minimalist space. This Villa in Mallorca, Spain says it all from the space available to the clean contrast of black and white and a touch of wood on the floor, in addition to the black steel frames that reinforce the view that the house is able access. 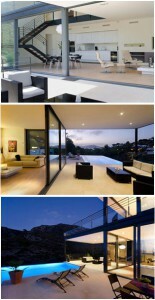 Indeed the minimalist space has gone from a stark and cold dwelling place to an ultra modern and homey living space.